I found tracking and budgeting very difficult this month – it was the combination of lots of spending on Christmas gifts and that we were traveling for over 1/3 of the month. Sticking to our discretionary budget was nearly a lost cause and not even our targeted savings accounts could save us completely! Zeroing-out-wise, it turns out that you can’t spend $460.34 on cell phones in a month (on a budget of $95) and expect to come out unscathed. Our non-discretionary categories aren’t changing at all now – INCOME, SAVINGS, rent, and internet – which you can find in our last budget iteration. Our GIVING to our church was a bit higher than usual in December – Kyle and I had a miscommunication that resulted in an “overpayment,” which we chose not to correct. Although our cell phone bills will be regular for most of the year, this month we had a crazy lot of spending. Last month we bought a new smartphone for me, but we’re waiting to cut off my old dumbphone until we’re sure that Sprint has adequate coverage in Durham and we won’t have to undo our decision. While the initial cost of my phone came out of savings, this month we paid two bills ($35 for the dumphone, $22.28 for the smartphone). Kyle also finally decided on a smartphone – the iPhone 5! So we bought one in December and paid double a monthly bill for the plan and a leftover bill from Kyle’s old phone. This is going to be even more of a mess than it already is because Kyle has nearly decided to leave AT&T for Verizon. Groceries: Another month over our budget, but I have all kinds of excuses! I also think we’ll do better next month. Gas: Because I reimbursed us for our gas spending to and from my parents’ house for our flights and while we were in CA, it seems we didn’t spend much out of our normal gas budget. We were only in town for a bit over two weeks because of our traveling so I guess that makes sense. Electricity and Gas: Under budget for this month, but not looking good as it gets colder here! Water: We reserved our full water budget this month to help pay next month’s double bill. We didn’t have too many transactions out of our targeted savings accounts this month, but the ones we did have were pretty large! We paid for our Christmas gifts out of this account ($381.90) and reimbursed ourselves for our travel gas ($100.95). The discretionary part of Kyle’s paycheck from November also went into this account. I would have reimbursed us more out of this account but we pretty well drained it! Kyle bought his new phone this month and we took $75 from this account (all that remained). We made a spontaneous cash donation to Kyle’s parent’s church and picked out a few gifts from the Samaritan’s Purse gift catalog. We took $138.99 from this account to pay for the remainder of Kyle’s new cell phone. We wrote three new budgets last month and it looks like we’ll be implementing the “payroll taxes” version of our budget, at least until fiscal cliff negotiations continue (?) in a few months. We blew it! We took a cash infusion of $138.53 from our nest egg to zero out this month. That’s the first time in the 9 months we’ve been doing these updates that we’ve had to do that! Here’s to going back to usual in the new year. How crazy was December for your budget? How did you handle paying for Christmas? Do you overlap your phones when you sign a new contract to make sure everything goes okay? 20 Responses to "December 2012 Month in Review: Money"
December is always a bad time of year for budgets, even if you manage to back on the Christmas presents you end up buying more food and gas gets more expensive as everyone wants it. I pretty much write off December every year. Don’t know if it’s too late – but did you guys consider going pre-paid with your smart phones? We’ve got < 1 year left on our contracts, but then we're really considering going prepaid. Mr Money Mustache did a good review on this, and if you live in a decent coverage area, it can save big bucks! Kyle has done prepaid in the past and hated it. My phone is no-contract and Kyle is now in a 2-year contract – he’s not happy about it but he really wanted 4G, which wasn’t available in our area any other way. 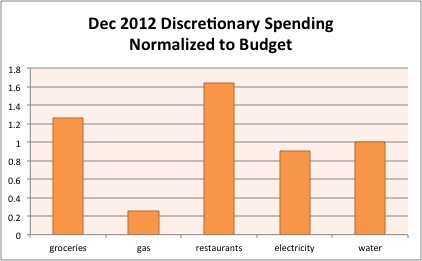 We did fairly well with our budget in December. It was lighter in terms of income, but we knew that and had planned for it. We’re actually buying my wife the iPhone today…hate to see that bill go up a little more. John S @ Frugal Rules recently posted..Frugal Friday: Posts That Ruled This Week, it&#8217;s 2013 Edition! Why is your bill going up – did she not have a smartphone before? We ended up (after a mis-step) sticking with Kyle’s previous plan and just upgrading the phone, so none of our bills will change (only an “upgrade fee”). Why did Kyle switch to Verizon? Virgin Mobile has the iPhone 5 as well, and you can get 1200 minutes per month and unlimited text and data for $45/month. A lot of people go with contract plans because better or discounted phones are available, but nobody ever discounts the newest iPhone and it IS available elsewhere. Kyle looked into Virgin Mobile, but he concluded that he wanted 4G and he read negative reviews about their data speeds. Data speeds can be hit or miss. If you are in a poor cell area, it will be like pulling teeth. Uh I feel you. Our December was filled with extra expenses. Looking forward to having a much better January. I wish December hadn’t happened in December, you know? I could have deal with extra travel and cell phone craziness in DIFFERENT months. When you track your budget down to the 5 quarters you give away, you know you’re doing something right! Being $138 off sounds incredibly close to budget to me. Ross recently posted..Invest in thermostats instead of stocks! I felt a bit silly including that but I told myself I would be totally honest in these reports! 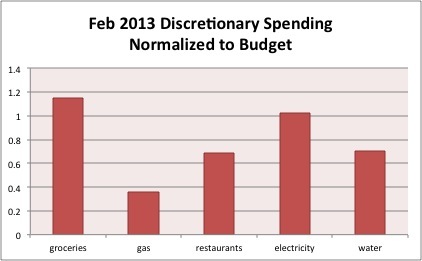 $138 is not at all close for us as we don’t have much discretionary spending. Within $25 I would consider close. December it tough for most people. I think we managed to stay within our budget, or pretty close, but we’re in a new year so I’m not even going to look at December’s spending. Don’t beat yourself up. I know all our months can’t be in the black, but I’m happy about the track record we had leading up to December.